The Chesapeake Monitoring Cooperative (CMC) recently unveiled a new website (chesapeakemonitoringcoop.org). The online cooperative provides a platform to share CMC services and resources that have been developed over the past three years and are freely available. The CMC brings together a diverse group of people who monitor water quality to provide a greater understanding of Chesapeake Bay watershed health. The new website helps promote collaboration among monitoring groups throughout the entire Chesapeake Bay region. The CMC offers participating groups much more beyond the developed tools and resources. Partners work closely with monitoring groups to determine which parameters best fit water quality questions, to provide monitoring training workshops, to format their data for incorporation into a centralized data portal (the Chesapeake Data Explorer), and more. 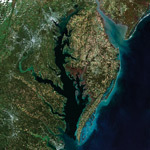 The Chesapeake Data Explorer is the portal for all of the data collected by CMC monitoring efforts and connects those data with the Chesapeake Bay Program. The new website can be accessed at chesapeakemonitoringcoop.org.